It was June 2017 when we lovingly said goodbye to the original Dogfish Head Brewings & Eats and transitioned into the brand new restaurant we built right next door. While our original building is gone, that space now houses a beautiful courtyard – complete with a covered patio – and the memories made within those old walls are still with us, manifested in the off-centered culture and décor found in our new brewpub. The thoughtful artwork that fills the walls of today’s brewpub is a representation of where we’ve been and where we’re going, complete with archival pieces of Dogfish history and innovative artistic creations. Let’s take a peek inside! As you approach our new brewpub, you’ll notice large circular windows surrounding our first floor booths. 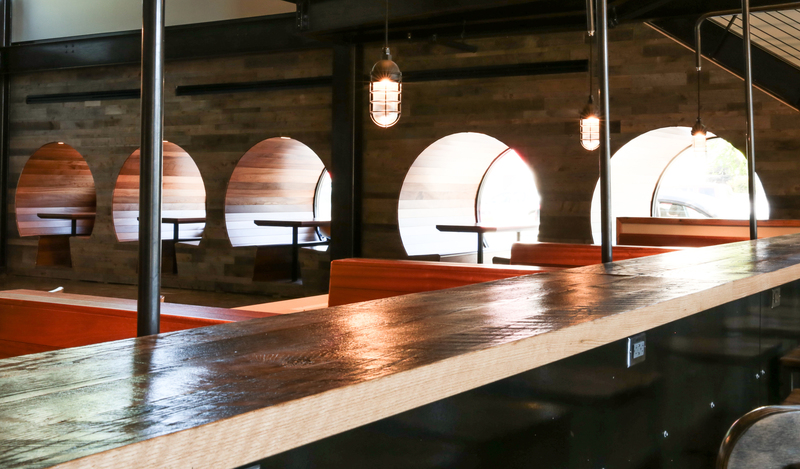 Designed by our pals at Digsau, these booths were created specifically for us and were made to resemble barrels used to store and age beer. 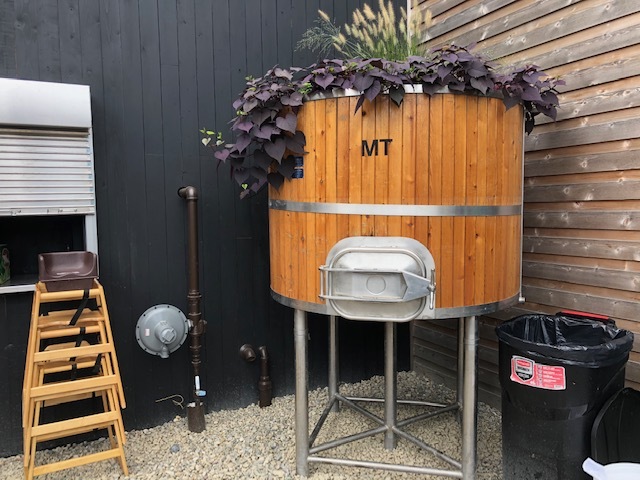 Right before you enter the brewpub, you’ll see an old mash tun stationed in our courtyard. When Dogfish founder and CEO Sam Calagione first decided to open a brewery he dreamed of an old English mash tun, but alas it wasn’t the time and other areas of the operation demanded attention. Many years later, a chance encounter would make that dream a reality, and the perfect decorative planter for our new outdoor space! Upstairs you’ll find a ‘Maxwell’s’ sign. No, it isn’t a shout out to the coffee brand. 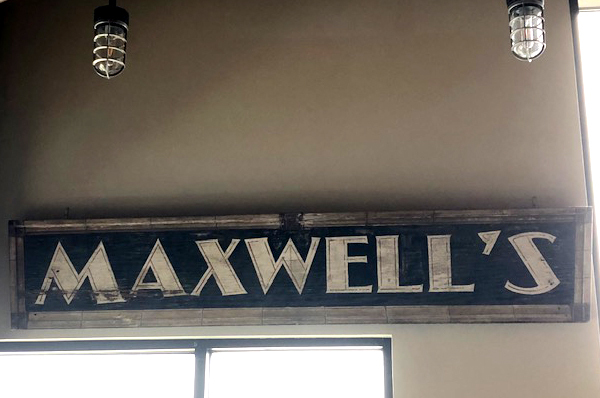 It’s actually a sign from the famous Maxwell's Tavern in Hoboken, New Jersey! Maxwell's original owner Steve Fallon moved to Rehoboth Beach a number of years ago and now runs two local record stores. Needless to say, Sam and many of our Dogfish co-workers are regular customers! When we opened the new building, we were proud to provide a home for Steve's piece of music history. Speaking of live music, our new brewpub hosts live musicians three times each week! 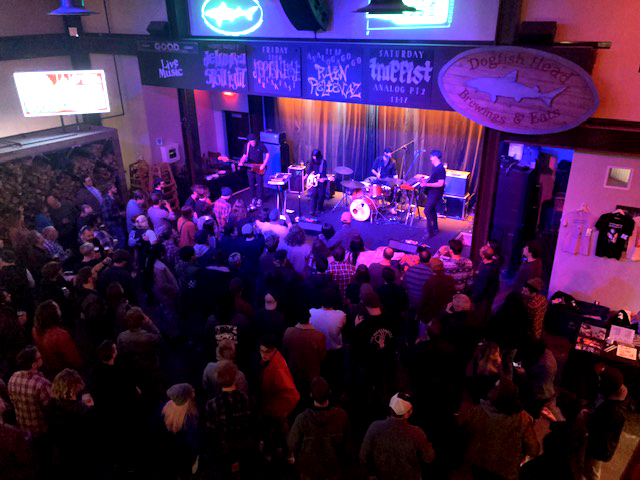 On Wednesdays, local artists take the stage during our Delmarva Spotlight nights, and on Fridays and Saturdays, bands both large and small, from all corners of the country, steal the spotlight to share their tunes with our lively crowds. If you’re ever visiting and want to know who our next featured musician will be, just take a look above our stage. Each upcoming artist’s name and the date on which they’ll be playing are featured on a separate chalkboard sign … all of which are hand-decorated by our awesome co-workers. Off the back of our stage is our ‘green room.’ This is where our weekly artists can gather, relax and prepare for their shows. It’s also where they can leave their mark on the restaurant by writing their names or placing their bands’ stickers on the walls. Check out some of the great groups that have graced our stage! Heading back out into the dining room, just to the left of our stage, there’s a large, compartmentalized wall full of wood! With wood-fired food at the core of our essence since 1995, this functional piece of artwork stores the wood used to power our wood-fired oven. On the wall above our wood-fired oven, you’ll see a HUGE quote by Ralph Waldo Emerson. The quote – “Whoso would be a man, must be a nonconformist. He who would gather immortal palms must not be hindered by the name of goodness, but must explore it if it be goodness. Nothing is at last sacred but the integrity of your own mind.” – is stamped on the wall as a constant reminder of Dogfish Head’s off-centered ethos. Over by the restrooms, we’ve enlarged and framed a small sampling of our beer label artwork from some of the many talented Off-Centered Art Series artists we’ve had the good fortune of working with. You’ll find Marq Spusta’s Punkin Ale label from 2010, Dave Plunkert’s Chicory Stout label from 2011, Jim Mazza’s Festina Peche label from 2013, Jermaine Rodgers’ Festina Peche label from 2014 and Drew Milward’s Romantic Chemistry label from 2016. And before you head back out into the dining room, don’t forget to check out the awesome Dogfish banjo hanging on the wall! Hand-crafted by our pals PD Camenisch and Jim Keane, and given to Sam as a gift, it’s truly a one-of-a-kind masterpiece! 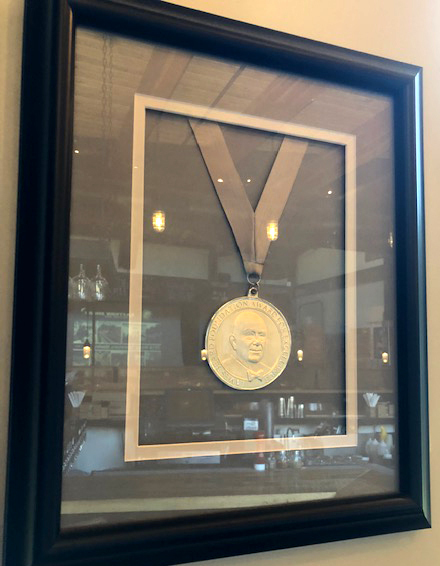 Beside the bar, you’ll see Sam’s 2017 James Beard Award for Outstanding Wine, Spirits or Beer Professional. 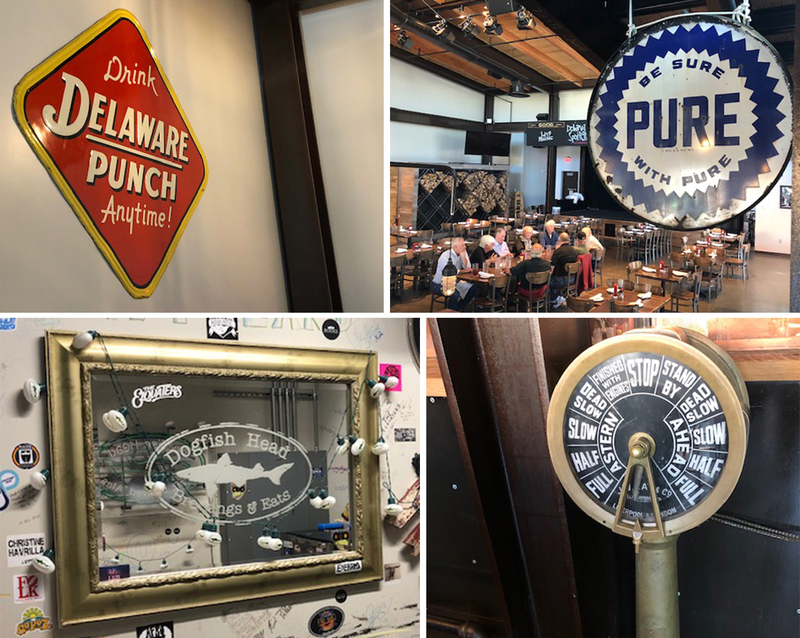 Upon accepting the award, Sam thanked his “wife and business partner, Mariah, and the 200-plus co-workers who work hard to make our off-centered company tick.” The award now hangs where Dogfish got its start – in Rehoboth – as a reminder of how far we’ve come. While most of the décor pieces have a story, there are few that are there ‘just because’ … and we’re okay with that. Some have been with us since the beginning, like the antique ‘be sure with Pure’ sign hanging above the host stand, the nautical scale beside the host stand and the old-fashioned LED ‘Wood-Fired Food’ sign in our window. 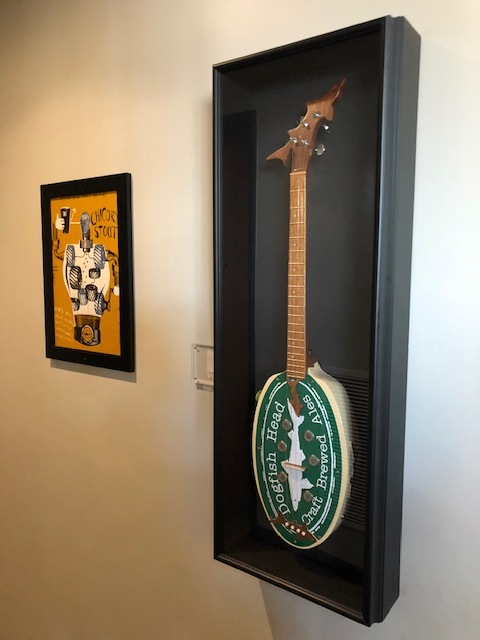 Others include the Dogfish Head mirror, LED sign and logo’d coat hangers in the ‘green room,’ and the rubber chicken hanging behind the bar. It seems our bartenders might have the story behind that last one, so be sure to ask ‘em the next time you visit! 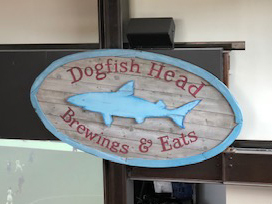 And FINALLY, the last and most iconic piece of Dogfish décor, displayed up in front of the dining room for the whole restaurant to see is the sign from our original brewpub. Serving as an ode to our past, this sign is a reminder of how we got to where we are today and a sense of inspiration to continue being the wonderfully off-centered and thoughtfully adventurous craft beer innovators you’ve come to know and love. It’s one piece of artwork that’ll never change or come down! So next time you stop by, see if you can spot all of the décor discussed above … cheers!